Today was one of those (relatively few) days, when I forsake all my youthful yearnings for extreme sports, shopping, museums, nightlife, and instead settle for a day of picture-perfect domesticity. I decided to take it to a relative extreme and spent a few solid hours in the kitchen, cooking enough food to last us a week. Perhaps, I was just trying to prevent those inevitable weekday evenings, when you come home entirely too late to cook, and entirely too tired not to fall back on some less healthy option. So I cooked... stuffed peppers, cabbage salad, bean soup and dried apricot cake. As this is too much food for one post, I will only describe the first two. 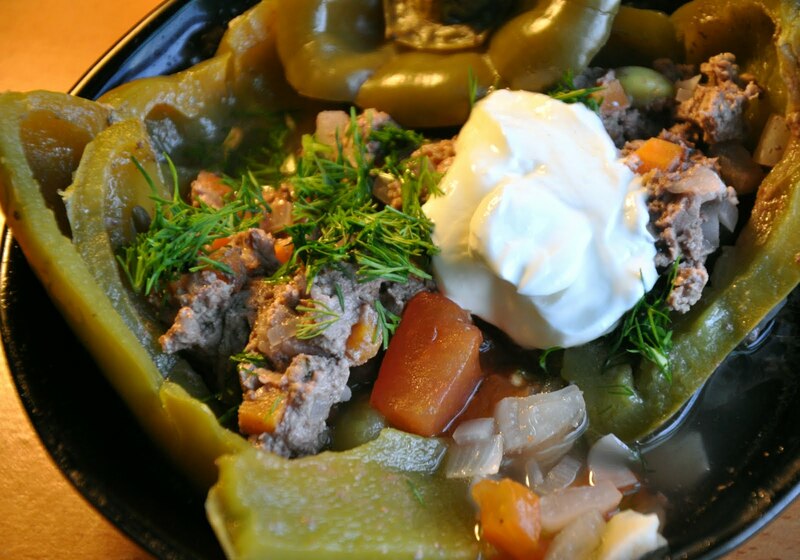 Stuffed peppers are a traditional Russian dish, and my all-time summer favorite: healthy, satisfying and colorful. The peppers can be stuffed with ground beef and cooked rice (most traditional option), or with potatoes and other vegetables for a vegetarian option. I made a mix of the two, which came out quite well and had the authentic taste of my childhood at the dacha. The filling. Cut one onion, carrots, potato into tiny cubes, - that is the tastiest size. Mix them into the sirloin until evenly distributed. Add finely chopped serrano, ground pepper, a pinch of salt and oil and mix again. That's it for the filling. T h e p o t. Choose a pot that is just large enough to hold all the peppers. This way, they will support each other as they cook. Line the floor of the pot with the other chopped onion, chopped tomato, dill (not necessarily chopped), roughly chopped garlic cloves, capricorns and bay leaves. Add a pinch or two of salt. T h e p e p p e r s. Cut off the top of each pepper, - this will serve as the lid. Cut off the white inner flesh from the top and the inside of the pepper, keeping the pepper whole. 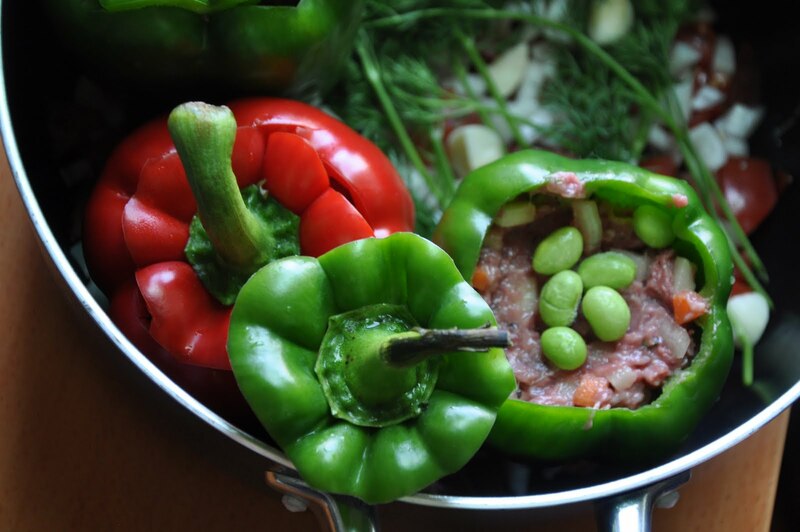 Stuff each pepper with the filling, ensuring that the filling is evenly distributed among the peppers. Optionally, through a couple of frozen/fresh edamame over the filling in each pepper. Place peppers in a pot (see picture with uncooked peppers). Add water to the each pepper, until the filling is moist and cover each pepper with its "lid". Add water to the pot, until it covers 3/4 of the pepper's height. Cover with a lid and set on medium heat. The cook time is about 45 minutes. Just make sure the filling is cooked through. To serve, place a pepper in a bowl and cut in half. Spoon up a little of the broth from the pot onto the pepper. 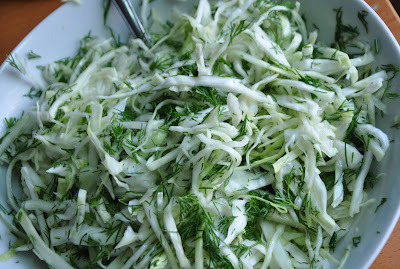 Add a pinch of fresh dill and a spoonful of sour cream. It may not have refinement enough for a spoilt city-dweller's palate, but this healthy country dish warms my heart every time. Traditionally served in spring, this is arguably the simplest salad one could come up with. Doubtless inspired by rural scarcity - not refined culinary minimalism - this salad is composed of 4 ingredients. Yet, it lacks nothing. The key is the cabbage, which must be the spring kind with a leaves greener and tenderer than during other seasons. Cut the cabbage into thin straw. Sprinkle it with salt, squeeze the cabbage vigorously while mixing it with the salt, until it draws a little bit of juice. Add chopped up dill, oil, and mix again. That's it! And it smells and tastes like spring.